One Last Letter is the story of Evelyn Lancaster, a romantic hardened by reality, and Jesse Greenwood, a cowboy returning to what he left behind. The rough, reticent cowboy returns to Texas with new wealth to save his first love's ranch from financial ruin while she hopes for a second chance after she was forced to spurn him years ago. 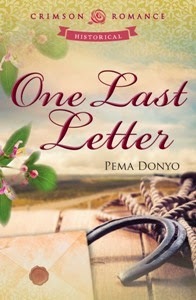 Will one last letter give them the courage to say yes to love on the wild Texas plains?